Like many other web hosting providers 1and 1 offer email hosting as part of their web hosting package. Hosting email and websites on the same account is common and the easiest and cheapest option for small businesses. One and one provide two email options called basic mail and Business mail. They also provide email as a stand alone service without hosting. By default web hosting accounts will have basic mail as part of the web hosting package, but you can upgrade to business mail if you want. 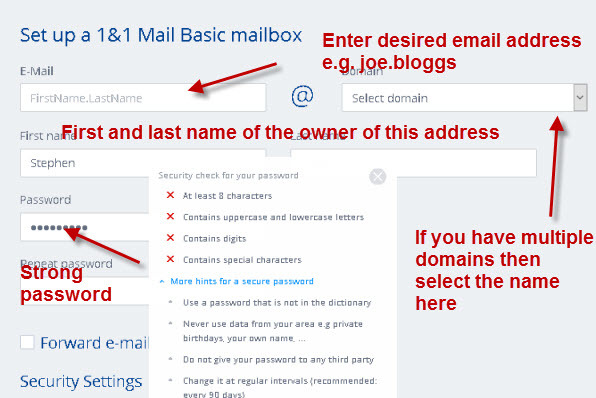 In this tutorial we look at how you create new email addresses and mailboxes on your 1and1 hosting package. 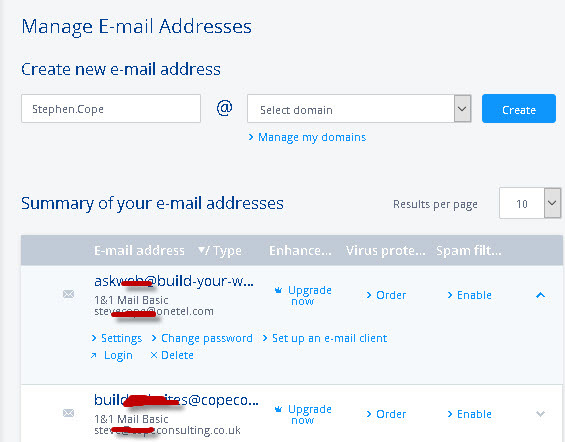 Login to your Hosting package and scroll down Mail section and select the Create New Email Option. Next select the email account type you want to create. The basic is free with the standard hosting package, and the business email account costs extra. 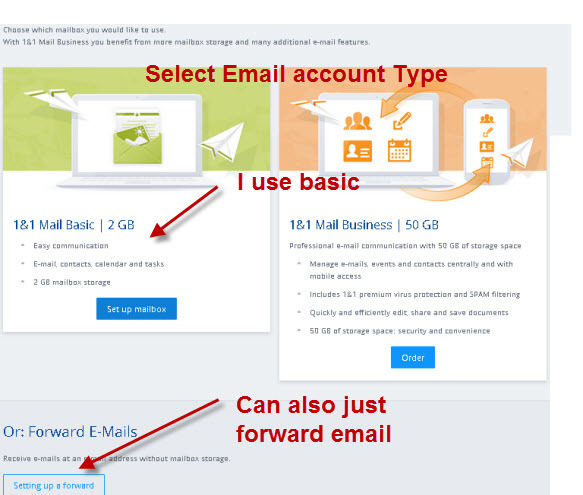 I use the basic email account and you can always upgrade them later if you find you need extra storage. Click the account type and a new email account form appears. Now enter the new account details. If you have multiple domains then you need to select the domain name. For business email accounts you should decide on a naming system. Common is. If you scroll down you can add spam and anti virus checking (extra cost), you can add them later if you need them. Note: I don’t use them as I use Windows live mail and a PC virus checker. Click save when done and you have a new email account. The summary screen show you the account details with the option of printing them or sending them to an email address. If you scroll down you will find client setup details and a link to create a new email account or back to email Overview. The email overview gives you a list of all your current email accounts. This is the main screen for managing you email accounts. From here you can change passwords,delete and account,setup virus checking,spam etc. An autoresponder is an automatic response to an email and is often used by sales organisation. It can be used for sending addition information or merely to inform the sender that their enquiry has been received. 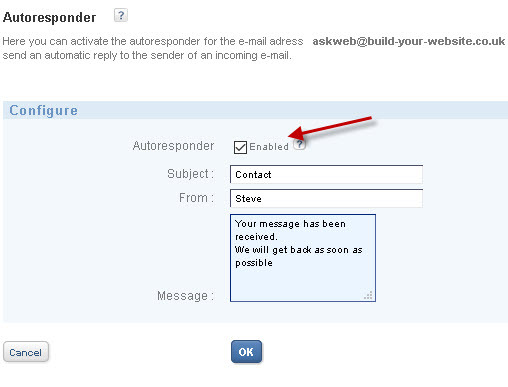 To configure an autoresponder select the mailbox and click on settings. The scroll down the page to locate the autoresponder. 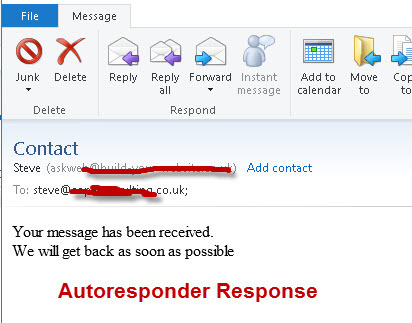 If you now send an email to the autoresponder email address then you will receive the automatic reply that you see. 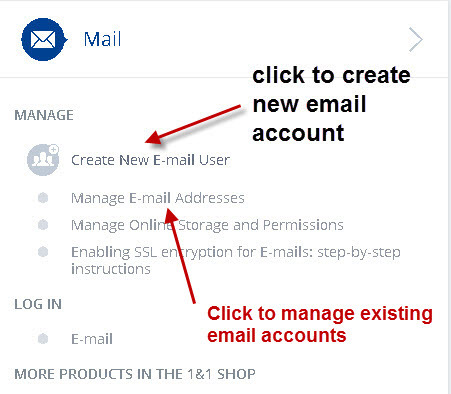 1and1 provide secure access (SSL) via webmail. You can access webmail via the 1and1 home page or by going direct to webmail.1and.co.uk or here for USA. They also provide access using IMAP,POP3 and SMTP also using SSL (secure sockets layer. 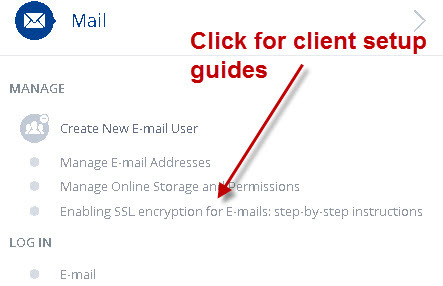 They also provide some useful quick setup guides for the most popular email clients.